Kimpton’s Serrano Hotel, home to Jasper’s Corner Tap & Kitchen, an award-winning restaurant and local hot spot, is offering beer lovers the chance to sample some of the city’s best brews before they take in San Francisco’s spectacular views of the Bay, Golden Gate Bridge and so much more. Guests who book the Brew and View package will be treated to deluxe accommodations at this San Francisco Boutique Hotel and a flight of local beer at Jasper’s Corner Tap & Kitchen. San Francisco may be best known for its sour dough bread and the Golden Gate Bridge but it is also home to a number of fantastic and innovative microbreweries. Kimpton’s Serrano Hotel, home to Jasper’s Corner Tap & Kitchen, an award-winning restaurant and local hot spot, is offering beer lovers the chance to sample some of the city’s best brews before they take in San Francisco’s spectacular views of the Bay, Golden Gate Bridge and so much more. Kimpton's Serrano Hotel in San Francisco’s theatre district is just blocks from Union Square's endless shopping and dining options. The old-world glamour and timelessness of the Serrano blends with stylish comfort and warm Kimpton hospitality for a San Francisco stay that is anything but ordinary. The236 guestrooms and suites boast a luxurious residential atmosphere with large windows, plush beddings and exotic Spanish and Moroccan accented ceilings rich with bold colors reminiscent of a theatrical set. . Located adjacent to the Serrano Hotel, Jasper’s Corner Tap & Kitchen offers a central gathering place, where tavern-inspired fare meets beer, hand-crafted cocktails and wine. With 18 beers on tap and more than 60 beers by the bottle, Chef Adam Carpenter’s menu is designed to complement the restaurant’s extensive beer selection. The restaurant is open for breakfast, lunch and dinner daily, as well as brunch on Saturday and Sunday. Jasper’s Corner Tap & Kitchen is named after one of San Francisco’s first surveyors, the legendary Jasper O’Farrell. O’Farrell helped shape the city’s landscape, most notably with his diagonal creation of Market Street, in order to encourage a more social city. He was also instrumental in the naming of a number of other San Francisco streets, including Lombard, Chestnut, Filbert, and Pine. 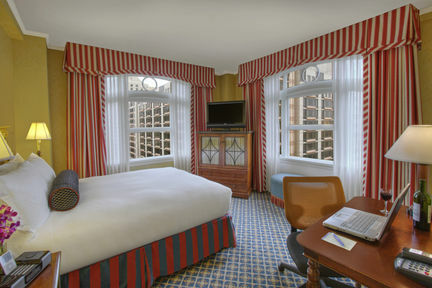 The Serrano Hotel offers guests signature Kimpton hospitality and historic style in San Francisco's Theater District. Surrounded by the city's top theaters, clubs, restaurants and shops, the boutique hotel provides luxurious accommodations and hotel suites along with unsurpassed services and amenities. For more information or reservations, please visit the website at http://www.serranohotel.com or call (866) 289-6561 or (415) 885-2500. San Francisco-based Kimpton Hotels & Restaurants, a collection of boutique hotels and chef-driven restaurants in the US, is an acknowledged industry pioneer and was the first to bring the boutique hotel concept to America. In 1981 Bill Kimpton founded the company that today is well-known for making travelers feel welcomed and comfortable while away from home through authentic and unscripted customer care, stylish ambience and embodying a certain playfulness in its approach to programs and amenities. Adjacent to the hotels are locally-loved, top-rated, Kimpton restaurants. Kimpton leads the hospitality industry in ecological practices through its innovative EarthCare program that spans all hotels and restaurants. Market Metrix, a recognized authority and leader in feedback solutions, consistently ranks Kimpton above other hotel companies in luxury and upper upscale segments for customer satisfaction. Privately held Kimpton was recognized by Fortune Magazine as a Best Company to Work for in 2012. The company operates more than 50 hotels and more than 50 restaurants in 23 cities. For more information visit http://www.KimptonHotels.com or call 1-800-KIMPTON.